It's citrus season in Arizona which means an abundance of oranges, grapefruits and lemons are available everywhere you look. If you happen to be one of the few people in the area without a citrus tree growing nearby no need to worry since people graciously share their harvest with friends, family and co-workers. You will often times find bags of produce at community events available for the taking. With this in mind I am joining this month's Progressive Eats dinner, a virtual version of a progressive dinner where people travel from house to house to share in different courses of a meal. This month we are featuring citrus in all of our recipes. My contribution to the meal is this decadent chocolate hazelnut orange cake. This cake can be made in a 9x9 square baking pan (like I did) or if you'd prefer a round cake you can use an 8x2 round pan. It's really up to you, but I prefer the square for aesthetic reasons. Preheat the oven to 350 degrees. Line a 9x9 square pan with parchment paper so that it overhangs on all sides (this will make it easy to remove). Place the entire orange in a sauce pan and cover with water. Bring the pot to a boil then cover, reduce heat to low, and simmer until orange is soft, about 2 hours depending on the size. Once the orange has cooled slice it in half and remove any large seeds. Place the orange in a food processor and pulse until smooth. Add all the remaining ingredients to the processors, except for the powdered sugar. Pulse a few times, until the mixture is well combined. Pour the batter into the pan and bake for 45 minutes, or until a toothpick inserted in the center comes out clean. Remove from oven and allow to cool in pan on a cooling rack. Serve sprinkled with powdered sugar. Chocolate, hazelnut, and orange are like a dessert trifecta - great recipe! Love the flavors in this! Love the combo of chocolate and orange! Such a nice crumb on the cake! Lucky you surrounded by all the fresh citrus! What an intriguing way to get so much orange flavor into a cake. It looks so moist and wonderful---and I'd sure love a slice!! I always look forward to this time of year to get all the citrus varieties showing up in the markets! So you put the whole orange in, unpeeled? Very cool!! I used to make a lemon tart that used the whole lemon! I have to wait a bit longer for citrus season here but will be trying this soon! I absolutely love chocolate and orange together!! GOODNESS this sounds amazing. Chocolate Orange! Yes please!! Oh yum! There is nothing like the flavor combo of chocolate plus orange! This cake sounds delicious! Love these ingredients together! So yum! I LOVE how orange compliments chocolate. This looks so good! I love this kind of European style cake ~ and who can resist hazelnut flour?? Wow - hazelnut flour. That sounds so good, especially with the citrus. And boiling the whole orange - what an intriguing and fantastic idea! I've never used hazelnut flour before, but now I want to try!! This looks like an amazing chocolate cake! Oh, man, I bet this is fudgy and amazing, Theresa! What a wonderful flavor combination--I'd love it in coffee form: chocolate-orange-hazelnut to drink right along with a slice of this cake! Yes!! All I have to find is hazelnut flour. Or maybe I'll just grind up the hazelnuts in my pantry. Gorgeous cake. 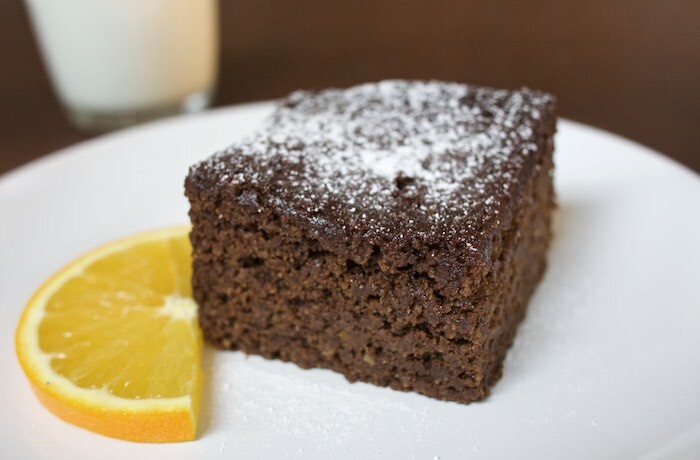 I made a chocolate cake with orange not long ago and I simply LOVE the flavors together. Combined with hazelnuts? I can't wait to try this! This sounds fabulous! I love chocolate and hazelnuts, and the bright citrus flavor of orange is sure to enhance that! Lovely! I love a hint of orange in my chocolate! What a beauty of a cake!